Arthur Coningham was a natural athlete, and superb cricketer, footballer and billiards player. He was selected for the 1893 tour of England but his eccentricity ensured that he was not in the test team. Most infamously, Coningham was so cold fielding in the outfield during a game at Blackpool that he started a small fire, which was quickly supplemented by two hot potatoes donated by a spectator. Not even the heroic saving of a child from the Thames could change his rapscallious reputation. Coningham had to wait for the visit of England in 1894 before his first, and only, cap. On a wicket described by Wisden as “in a very bad state from the recent rain” his impact was immediate. 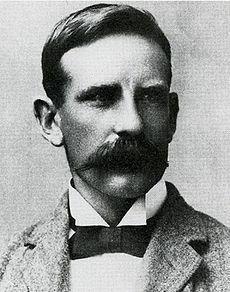 With his first ball, and the first of the match, Archie MacLaren was caught by Henry Trott, making Coningham the first man to get a wicket with his debut ball at the highest level. However the rest of the game did not proceed as smoothly for Coningham or for Australia. After bowling England out for 75, with Coningham earning figures of 2/17, they were dismissed for 123. England’s captain A.E. Stoddart scored a century in the second innings as the visitors amassed an impregnable total, during which Coningham was no-balled for supposedly deliberately throwing a delivery at the centurion. It was almost certainly a need for money which led him down the path that secured his notoriety. Coningham concocted a plan. Alice, his Catholic wife (Arthur was an Anglican), was a regular worshipper at St. Mary’s Cathedral in Sydney, seat of Cardinal Moran. Coningham sent letters to the cathedral claiming that the cardinal’s private secretary, Denis O’Hanan, had conducted an affair with Alice. $5,000 would keep the silence. When the letters were ignored, Coningham took his case to court. O’Hanan was born in Ireland and after training in Rome was recommended to Cardinal Moran by Pope Leo XIII. The charismatic Irishman became a friend and confidant to Moran, and became so well-known among Sydney’s Catholics that his photo could be bought at church bazaars across the city. Alice Coningham claimed that her third child, Vincent, was fathered by O’Hanan. Furthermore in the trial, at the prompting of her husband, she went into salacious detail about her encounters with the Irishman: they had consummated their passion in the sacristy, in the Cardinal’s Hall, in the waiting room, in the Presbytery and many more locations in and around the Cathedral. The affair was conducted on Friday nights, she said, so that O’Hanan could go to confession on Saturday. Not surprisingly these details in the trial shocked, or more likely titillated, many Australians and the case quickly grew to assume wider implications. Many Catholics were appalled at the allegations, seeing them as a broader assault on their religion. Coningham, who was representing himself after his lawyer walked out upon learning that Alice and Arthur were still sharing a bed, was happy to receive help wherever he could find it. This came from Protestants such as William Dill Macky, president of the local Orange Order. The battle lines had been drawn, and the plot became murkier. An anonymous Catholic priest contacted Coningham under the pseudonym Zero. For reasons never made clear he hated O’Hanan and during the trial helped Coningham concoct a variety of attacks on him. The most dangerous was the theory that if a priest admitted a sin at confession he could he deny it later. The implication was clear and seemed to many Catholics as confirmation of their fears. The theory would become the basis of a long-running newspaper debate between Dill Macky and local Catholic clergy. Eventually the all-protestant jury returned to announce that they could not reach a verdict, to the disappointment of the 5,000 people who had assembled outside the courtroom. Cardinal Moran decided that a new tactic was needed to ensure success in the retrial. Reaching out to his influential friends, Moran asked W.P. Crick, Post Master General of New South Wales for assistance. Crick discovered the letters between Zero and Coningham, informed the cardinal of Zero’s identity and in a cunning twist designated his assistant to impersonate the disenchanted priest. Between the two trials “Zero 2″ fed Coningham misinformation, which would prove to be his downfall. Despite a five hour closing speech, Coningham’s case was thrown out by the second jury. O’Hanan emerged with his reputation saved and a hero to Australian Catholics, who contributed all his court costs. Dill Macky saw further evidence of a Catholic menace in the case and founded the Australian Protestant Defense Association, which quickly grew to more than 20,000 members and helped cement the religious divisions in Australian society. Cricket was still feeling the tremors of this sectarianism in Bradman’s era. Coningham avoided the aftershocks of the trial by escaping to New Zealand but his financial position never did improve and his life took an inexorable downward path. He saw six months in jail for a petty crime, and in what was perhaps an ironic inevitability, was found to have committed adultery with a Mrs. Ryman. After Alice successfully petitioned for divorce in 1912, Coningham summarized his position, “In Sydney my wife said she did and the jury said she didn’t, in Wellington I said I didn’t and the jury said I did.” He moved back to Australia but his decline was such that he was admitted to Gladesville Mental Hospital in 1937, and died in the institution in 1939. A good read this, and a reminder that it’s often the most obscure players who have the most interesting lives. The obituary in Wisden in 1940 omitted all details of his colourful post-cricket life; perhaps now the obituarist would be more candid.